In this weekly segment, I will be featuring a specific fabric or material every Tuesday. I’ll discuss its characteristics, utility, and a few recommendations as well. Spring/Summer is on the horizon and I wanted to discuss my favorite lightweight material: Linen. Linen initially “began as a textile made from the fibers of a flax plant,” as Wikipedia would have it. Nowadays it’s more of a loose, general umbrella term for a light weave texture that sometimes incorporates other fabrics such as hemp, cotton, or synthetics. The first thing you’ll probably notice about the appearance of linen is that it wrinkles very easily. That’s a part of the aesthetics that gives linen its charm. Linen wrinkles very easily because it is light and crispy, and consequently has poor elasticity. Learn to embrace the whiskers and creases that naturally occur along the lines of your body. If you can’t deal with it and feel the compulsion to iron out these wrinkles, then you’re probably already late to your mid-week bingo session, old man. When it comes to feel, linen lies on the thinner end of the spectrum. It feels crispy and textured but won’t stretch much at all. It is incredibly breathable, which makes it an ideal warm-weather fabric. 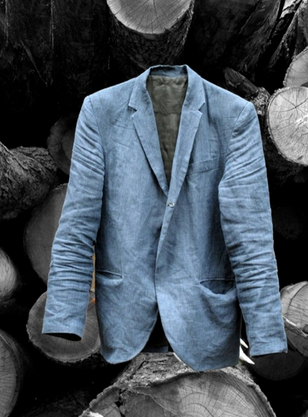 Linen has the ability to absorb and release humidity incredibly quickly– that’s why many clothiers use linen as a basis for their spring/summer light blazer and button down lines. 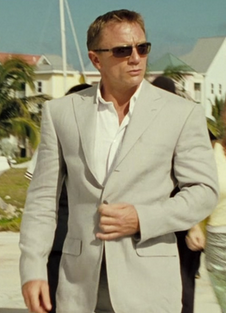 Daniel Craig looks sprezzy as all hell in linen! That should be reason enough for you to #gogetyousome today! Throw those heavy textures like wool and tweed back into storage! Here are some of my picks for great linen pieces to rock this s/s. Quick Caveat: try to limit your outfit to just one article of linen at a time, otherwise the texture at some point becomes too overwhelming. If you need a blazer for a cooler spring temperature or a more casual office setting, I’d highly recommend the Uniqlo Linen Cotton Slim Fit Jacket. They come in some nice patterns and the lighter colors will make others feel cooler just by looking at you. I personally have two of them and the fit is great OTR (off the rack) for me. Perfect to wear over a button down and chinos in slightly windy, sub-70 degree days. 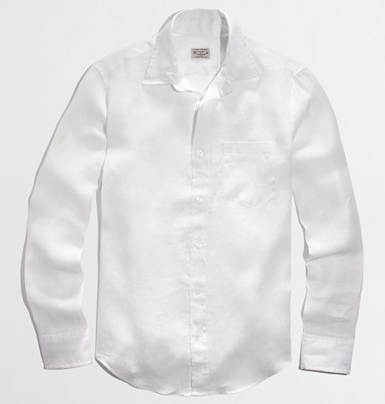 The J.Crew Factory Slim Linen Shirt is an affordable option in very soft greys, blues, and whites so that makes them pretty flexible to build an outfit around. Roll up the sleeves and wear ’em over chino shorts for a classic s/s look. H&M has a pair of linen pants in white, off-white, and blue. These would be great if you’re out on a golf course or walking around town. Pair with a waffle polo with some color or a 3/4 sleeve henley shirt and a pair of low profile suede oxfords for a refined casual look!